Course Info: The ONE-DAY ACLS program is for students renewing with current cards who wish to take the renewal program. This program covers the 12 core cases as outlined by the American Heart Associations which include: Airway Management, Bradycardias, Tachycardias, Cardiac Arrest cases Team Dynamics, Coronary Syndrome, Stroke. There is a 40 question Precourse Self-Assessment Test & 50 question test at the end of the class. Completion of the Precourse Self Assessment Test is optional prior to first day of class. This advance preparation will be very valuable as you will learn more and will be more comfortable with the course. Advance Preparation is highly advised to prepare for the skills test and written test. Continuing Education Accreditation: The American Heart Association is accredited by the Accreditation Council for Continuing Medical Education and the Commission on Accreditation of Pre-Hospital Continuing Education (CAPCE) for 12.00 Advanced Continuing Education Hours (CEH's). Prerequisite: Proof of previous AHA ACLS course & Current American Heart Association BLS for Healthcare Provider CPR card. 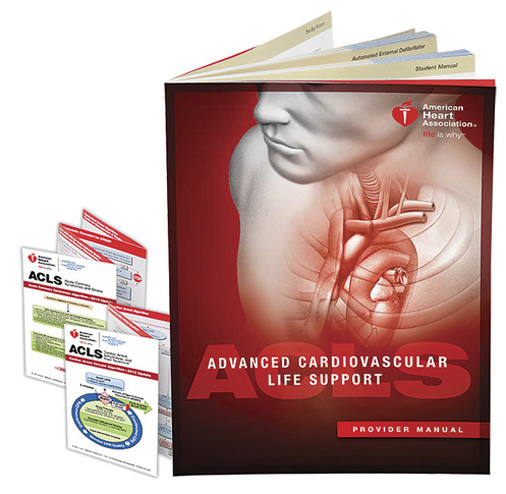 If your BLS card is expired, you must complete the BLS for Healthcare Providers course completion challenge testing during the Advanced Cardiovascular Life Support (ACLS) and written exam, an additional $42. If you do not have an American Heart Association BLS Healthcare Provider card you must take a full course. After successful completion you will be issued a current AHA BLS Healthcare Provider Card. Precourse Self Assessment Test: Pre-Test is an optional module to help you pass the in-person Megacode testing. Pre-Test Available at www.heart.org/eccstudent Click on "Pre-course Assessment" Password given once you register. You can call the AHA National Service Center at 1-877-AHA-4CPR and provide them with the information above to verify the class as an approved American Heart Association (AHA) Advanced Cardiovascular Life Support (ACLS) Class. You must have a current (not expired) American Heart Association BLS for Healthcare Provider CPR card prior to the start of the course. 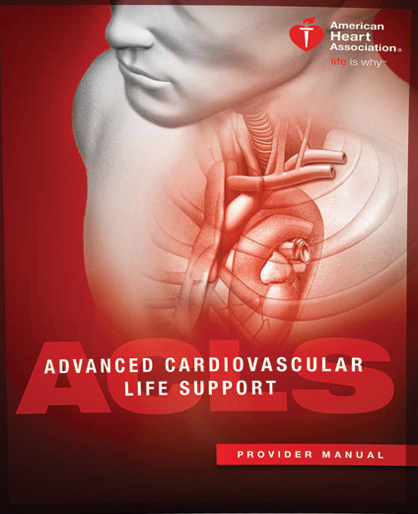 If expired, you have the option to renew your BLS for Healthcare Providers card during the Advanced Cardiovascular Life Support (ACLS) course, for an additional $42. Since this is a “test-out” option, it is the student’s responsibility to be familiar with the AHA Guidelines for CPR before testing and written BLS Exam. You will receive both certification. I have a Current AHA BLS CPR Card. I will take a full AHA BLS course before my first day in the ACLS course. If you do not have an American Heart Association BLS Healthcare Provider card you must take a full course (see our BLS Calendar), see above prerequisites for more info.